If these walls could talk’ goes the old saying. Oft muttered in places of historical importance or particular notoriety it is jolly good fun to imagine what rum goings on the walls have borne witness to. In The Blue Posts the inanimate object I’d be most interested in striking up a conversation with is actually the carpet. From your first step into this pub it’s difficult not to notice the threadbare tapestry of stains underfoot sporting a pattern straight out of the 60’S ‘Bingo Hall Chic’ range. It could probably offer up enough forensic evidence to fuel a whole season of CSI or cofound Sherlock Holmes. In a word, it’s gross, but it’s also indicative of what gives this pub its soul. In the very heart of Soho ‘The Blue Posts’ is a stalwart throwback which has either refused or failed to keep up with the relentless modernisation of all that stands around it. As the peep shows and prostitutes leave the rapidly gentrifying area this little island remains untouched. In this sense, and no other, this pub is a breath of fresh air after struggling to find something that stands out amongst and endless stream of places which all seem to be pretty much the same. It’s also a reassuringly local affair and on a Saturday afternoon an array of characters cascade merrily through the establishment; geezers, tarts and blokes who look they ought to be on some sort of register all merrily sup in the soporific gloom. Given that it’s not been redecorated or possibly even cleaned for the past five decades this pub isn’t going to be for everyone. There are a only a lowly pair of ales on tap so it’s not going to satisfy any true booze aficionados and it doesn’t offer up a menu for those who like a bit of gastronomic indulgence. But if you removed the flat screen and the smart phones and it would be easy to imagine Paul Raymond could walk in with a tart on each arm at any minutes. 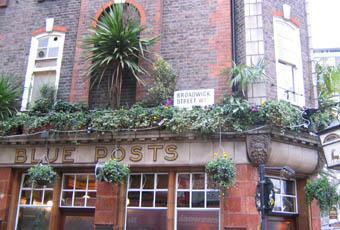 This is a pub for those who want to visit the real London. Not the picture postcard quaintness but the grime and the honesty. You’d be hugely missing out if you passed through Soho without dropping in here for at least a pint and some pork scratchings but if you drop one I’d just let it go, this is one carpet where the 5 second rule simply doesn’t apply.